Blood gas analysis (BGA) serves the purpose of assessing respiratory function and the acid-base balance. The most important parameters for determining respiratory function are the partial pressures for oxygen (p02) and carbon dioxide (pCO2), as well as oxygen saturation (sO2). Using these parameters it is possible to detect pulmonary or, synonymously, respiratory insufficiency (formerly termed respiratory partial insufficiency) and ventilator insufficiency (formerly termed respiratory global insufficiency). For assessing the acid-base balance, pH value, pCO2 and base excess (BE) are important. By referring to the pH value, either acidosis or alkalosis can be diagnosed. By observing changes in pCO2 and BE it may be determined whether these are due to respiratory or non-respiratory causes (metabolic, renal, intestinal). CO2 indicates acidity and gives us information as to the respiratory system; the regulation of pCO2 takes place via ventilation (pCO2 lowered: hyperventilation; pCO2 elevated: hypoventilation). BE represents the bases and provides information on the non-respiratory system. BGA can be arterial or venous. The human body attempts to compensate disturbances in the acid-base balance. In the case of any disruption, compensation occurs by way of the system not affected. Respiratory disturbances are compensated via non-respiratory mechanisms and vice versa. For example, chronic respiratory acidosis would lead to counterregulation with a buildup of non-bicarbonate buffer bases (regulatory organ: the kidneys), and thus to elevated BE. This regulation therefore corresponds to changes which would occur in connection with metabolic alkalosis. In the case of acute respiratory acidosis, there is no time for this change to take place and the BE remains unaltered, in which circumstance often only an increase in ventilation by means of mechanical respiration is of help. 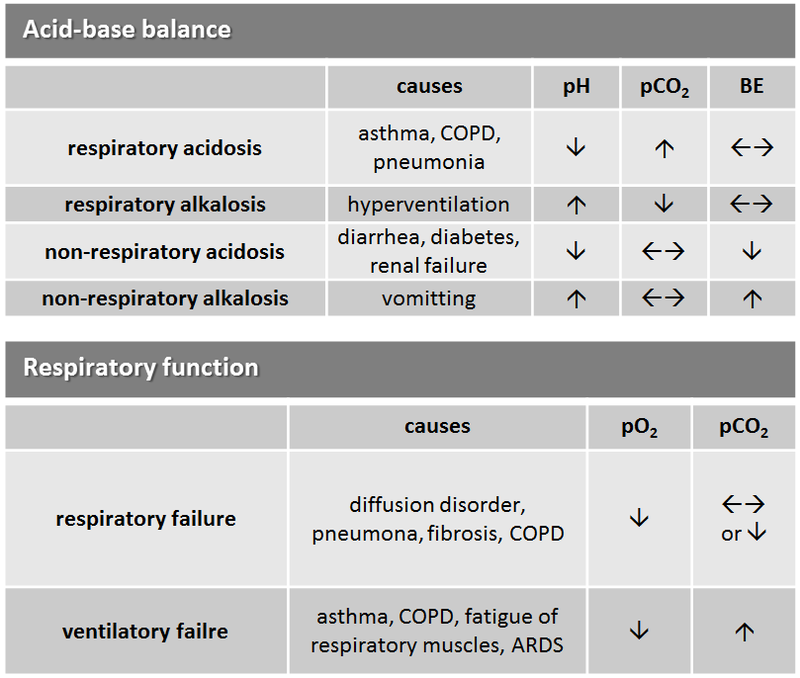 Disturbances in acid-base balance and respiratory function. The normal values are given in mean values. The width of the normal range should be taken from the responsible laboratory. Findings: 55-year-old female patient. Arterial BGA. Normal findings. Findings: 56-year-old male patient. Arterial BGA. Compensated respiratory acidosis with normal pO2 values, for example, in association with respiratory insufficiency during oxygen therapy.. Findings: 72-year-old male patient. Arterial BGA. Respiratory alkalosis. Due to the high pO2, not in order to avoid hypoxia, but rather psychogenic (hyperventilation). Findings: 56-year-old female patient. Arterial BGA. Severe respiratory acidosis without compensation in connection with acute respiratory insufficiency during oxygen therapy. Findings: 64-year-old male patient. Arterial BGA. Combined, primarily non-respiratory, renal (virtually non respiratory) acidosis. pCO2 value nearly back to normal during mechanical ventilation. Hemofiltration to treat renal failure. Ventilation is also massively disrupted, as, in contrast to the existing metabolic acidosis, massive hyperventilation with strongly reduced pCO2 would be expected here. Findings: 71-year-old female patient. Arterial BGA. Normal pH value, bicarbonate and BE lowered in association with metabolic acidosis with full respiratory compensation (pCO2 lowered). In cases of respiratory insufficiency, supplying oxygen is usually sufficient. A patient with acute respiratory insufficiency will generally have to have artificial respiration. In order to balance the pH value, the following holds true: required amount of bicarbonate in mmol = BE x body weight x 0.3. However, only half of this amount is administered. Beware: NO bicarbonate with respiratory acidosis! In this case, respiration should be optimized, if necessary until EMCO. A tris-buffer may be considered. The partial pressure of oxygen drops with increasing age. For adjusting the normal value, a general rule of thumb can be applied: pO2 = 100 – age/3.